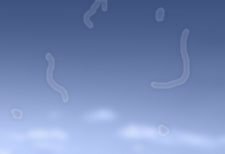 Floaters are little "cobwebs" or specks that float around in your field of vision. They are small, dark, shadowy shapes that can look like spots, thread-like strands, or squiggly lines. You can often notice them when you look at a plain background such as a white wall or a blue sky. They move as your eyes move and seem to dart away when you try to look at them directly. They do not follow your eye movements precisely, and usually drift when your eyes stop moving. As people reach middle age, the vitreous, a gel-like substance that fills about 80 percent of the eye and helps it maintain a round shape, may start to thicken or shrink. As the vitreous shrinks, it becomes somewhat stringy, and the strands can cast tiny shadows on the retina. In most cases, floaters are part of the natural aging process and simply an annoyance. They can be distracting at first, but eventually tend to "settle" at the bottom of the eye, becoming less bothersome. They usually settle below the line of sight and do not go away completely. A symptom similar to those one experiences with floaters is seeing jagged lines or "heat waves" in both eyes, often lasting 10 to 20 minutes. This is not caused by the vitreous gel pulling on the retina; instead, these symptoms are usually caused by a spasm of blood vessels in the brain, called a migraine. If a headache follows the flashes, it is called a migraine headache. When these jagged lines or heat waves occur without a headache, you are likely experiencing an ophthalmic migraine, or migraine without headache. Contact your eye care professional if you experience these symptoms. Sometimes referred to as "eye lightning," this sensation of seeing flashing lights or streaks of light is caused by the vitreous gel rubbing or pulling on the retina. These flashes might come and go for several weeks or months and become more common as we age. If you suddenly experience light flashes, you should contact Retina Vitreous Associates immediately; your retinal ophthalmologist can assess whether they are the result of a torn retina, a serious eye condition. Am I at risk for floaters and flashes?